Great things happen when sections come together to contribute toward a great cause. 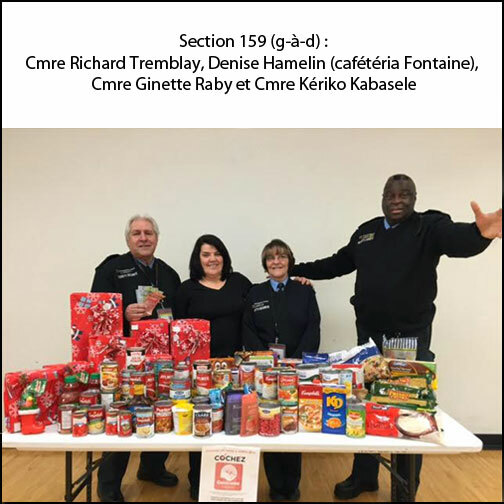 Last year, we shared the news that Cmre Sylvain Lafontaine, Cmre Denise Benoit and Cmre Simon Poulin at Section 163 were the driving force behind a tradition of donating items for the past three years to a family in need. 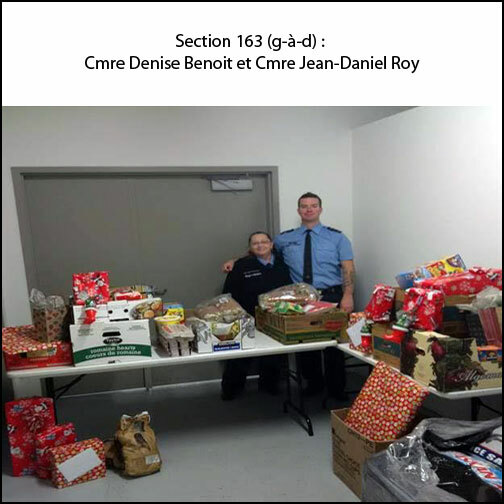 This year, commissionaires from Section 159 joined them to help spread even more cheer. Combined, Section 163 and Section 159 rallied together to donate gifts, food and cash to two single parents and three children totalling $755.00! They delivered the gift baskets just before Christmas. Bravo, Sections 163 and 159! Your gesture was generous and kind.